Successfully Added BattleStar 7 Inch Touchscreen GPS Navigator with Bluetooth to your Shopping Cart. The BattleStar, a new 7 Inch Touchscreen GPS Navigator with Bluetooth and FM Transmitter. This is the mother of all GPS Navigators, with robust GPS functionality, multimedia functions, AV input for your car rearview camera, and a 7 inch display so you can see it all in full clarity. Drive in comfort with your eyes at ease! No longer will you have to squint your eyes in order to read the display on your GPS unit while driving. The BattleStar GPS Navigator has a comfortably large 7 inch display and features and features an easy to use touchscreen icon driven interface to give you the perfect user experience. This GPS Navigator also includes support for rear view camera input along with automatic AV switch. This function is extremely useful as it helps you reverse and parallel park your car with comfort and ease because the GPS Navigator will automatically change to AV Rearview Camera view when you are reversing your car! The BattleStar 7 Inch Touchscreen GPS Navigator with Bluetooth is very versatile. It has Bluetooth functionality which allows for simple cell phone pairing, and it also has an M transmitter which enables sound output to your car speakers. Talk to your caller handsfree through the built-in MIC and listen to them on your car speakers - wow, won't that make driving to work easy!? In addition, you can even be viewing GPS maps while you have music playing in the background because this unit has DUAL ZONE functionality, allowing it to run media in the background while the GPS software is running. This portable navigator supports all of today's popular GPS software which include functions like voice directions, automatic re-routing (if you take a wrong turn), 3D mapping, night mode, and more. Use this GPS device to reach your destination on-time, every time! The BattleStar 7 Inch Touchscreen GPS Navigator with Bluetooth is a premium high performance GPS Navigator that has one of the most user friendly menu navigation systems around. The benefit to you - easy menu operation while driving means a safer ride. The Battlestar is a great product for either the resale market, OEM market, or personal/company use. It is available to you at the lowest price on the internet! So don't delay, click "Add to Cart" now and we'll express ship your order to you within 24-hours. Bonus 2GB SD Card Included - FREE! Loading files into the unit's internal memory is achieved through USB and Microsoft Activesync. Activesync is available through Microsoft directly. 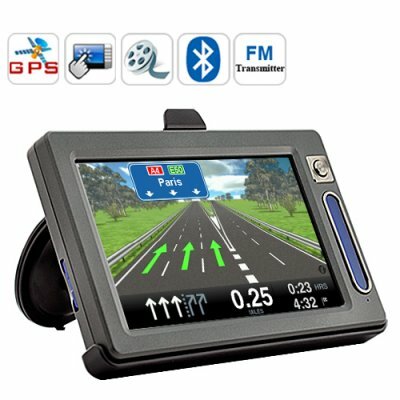 Can I listen to Music from the SD card while my GPS navigation application is running? Yes you can. Load your music first, then run your GPS navigation software. This is called "Dual Zone" and the Battlestar GPS Navigator does have this function! The antenna is built in, so all you need to do is insert your SD card with GPS software and maps that work best for your region and start using it straight out of the box. Yes, this GPS Navigator comes with a free 2GB SD card.